For 2012 the McRea Enduro Evo is equipped with a 250 Bhp and 550 Nm of torque alloy BMW 3 liter turbo diesel that is mounted to a Sadev SC 90-24 6 speed sequential gearbox. The new driveline has proven itself during the Silk Way Rally. 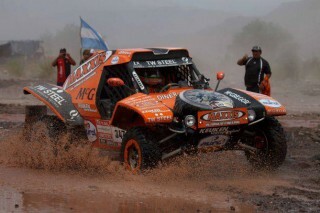 For 2012 the chassis has been extensively revised following the lessons learned from its Dakar debut. Sub-frames are retained front and rear but overall stiffness is boosted by more than 40%. Revised wishbones and refined geometry ensure the state-of-the-art Reiger dampers optimise traction and the turning circle is vastly improved.